Green senior Hailey Hammond began powerlifting just one year ago, but has quickly become one of the best young female powerlifters in all of Ohio. FRANKLIN FURNACE – It’s one thing to be competitive in every powerlift meet you enter. It’s another thing entirely to break records every time you pick up a weight in competition format. And not just break them records, but shatter them. In her most recent efforts at the Bill McClain State Powerlifting Meet on March 16th in Kenton, Ohio, Hammond broke all state records in her weight class (135 lbs. class): the squat record by squatting 365 lbs. (previous record 350 lbs. set in 2011), the deadlift record by lifting 335 lbs. (previous record 315 lbs. set in 2002), the bench press record by benching 155 lbs. (previous record 145 lbs. set in 2009), and the total weigh record with 855 lbs. (previous record 735 lbs. set in 2004). 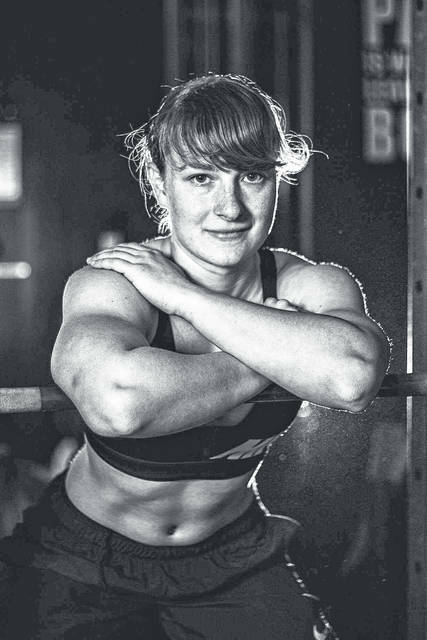 It’s safe to say the Green High School senior has a bright future in the powerlifting industry, a reason why we sat down with her for a Q&A about what it takes to make it to where she is today, what’s next for her, and much more. Q: What’s it been like with the success you’ve been having over the last few months? A: I see my success as something that started one year ago when I transitioned into powerlifting. These powerlifting meets were just something for me to do that happened to be the big eye opener to the dedication. I get congratulated by people all the time, sometimes by people that I don’t even know. These people are congratulating my accomplishments at the meet, but those accomplishments happened in the gym first. Q: For those who might not know, how much time and effort goes into being the best you can be at this? A: When I tell people that I have only been powerlifting for a year, their mouths drop, and they automatically assume that I am just naturally strong and/or gifted with these abilities. Although it is a blessing to have the ability to do this, I’ve put hundreds of hours into my training. I have never had more than three consecutive days off of intense training in these last 12 months. These training sessions have taken me three hours to complete at times which would then be followed by a training session the very next day, with the same intensity. My 1RM (one rep max or max-out) would climb rapidly in the beginning, although it would slow to the point of even plateauing these last couple months due to my body developing an immunity. To combat this, we resorted to changing some training habits and even training up to six days a week. My entire mindset changed from me adapting my schedule to “have time” to make it to the gym, to the gym adapting my schedule. It’s a lifestyle. Q: Who’s been your biggest support for this run, and how have they helped you along the way? A: My biggest support through all of this has definitely been my family. From providing a place to train, to even taking interest in me to be my coach, my family is what made this happen. My family has always been considerate and has been adapting schedules to allow me to have my training time. My coach, Austin, calls in to check on me every single day to check on my well-being and to ensure I make it to the gym so I don’t disappoint myself. Q: Do you feel like these competitions are only going to continue to become more popular as time goes on? A: I definitely think that powerlifting and the strength industry is growing in general. Look at the Arnold in Columbus! It’s growing by the thousands every single year. My hope is that it becomes its own OHSAA sport, just like baseball or basketball, because it was hard competing as an individual with people at my school not even knowing that it existed. Q: What would you say to a girl who might approach you and ask how she could start lifting to one day compete like yourself? A: I would be all ears to anyone who is seeking guidance. I remember exactly how I felt when I started and all the questions I had. It’s not easy to get up and go to the gym everyday, but you have to have the internal self-motivation that makes you want to get up and be successful in what you do. I would definitely help carry them as far as their own hunger takes them. What I love about this sport is that your success doesn’t rely on other people. Everything that you put in will come out in you, nobody else can do the work for you. That’s something that they need to know is that I can’t do it for them. But I will do everything I can to help get them where they desire. Q: What’s next for Hailey Hammond? What record or title is next in your crosshairs? A: I’ve had my head down for so long, working for these state records, that I honestly lost track of how much progress I’ve made compared to the professional lifting industry. Although I don’t have my sights on something in specific at the moment, I’m keeping my strength up to possibly start training for another major competition such as the Arnold this coming year. I have some time to figure it out but I’m sure I’ll be programming for something else soon.